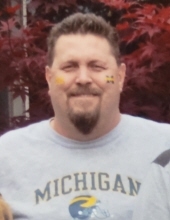 LAMBERT Christopher Allan - Age 49, of West Palm Beach, FL, died Tuesday, January 29, 2019. Funeral services will be held 12:30 PM Saturday, February 2, 2019 at Sharp Funeral Homes, Fenton Chapel, 1000 Silver Lake Road, Fenton. Pastor Ed Emmerling officiating. Burial in Flint Memorial Park, Mt. Morris. Visitation will be held at the funeral home Friday from 4-9 PM and Saturday from 11:30 AM until the time of the service. Those desiring may make contributions to the Christopher Allan Lambert Memorial Fund, c/o Sharp Funeral Homes. Chris was born July 8, 1969 in Flint, the son of Larry Wayne and Beverlee Ann (Ranowski) Lambert. He was a 1987 graduate of Lake Fenton High School. He had resided in West Palm Beach, FL for the past 15 years coming from Gaines/Durand. Surviving are: Parents, Larry and Ann Lambert of Fenton; sisters, Laurie (Dave) Webb of Morrice and Heather Wheeler of Grand Blanc; brother, Shawn Lambert of Fenton; his life partner, Margaret Wallace and her daughter, Katie Starkey of West Palm Beach, FL; nieces, Michelle Lambert, Alyssa Wheeler, and Kayleann Webb; nephews, Michael (Jessica) Hammond and Thomas Webb; uncle, William Allan Ranowski of Flint; and several other uncles, aunts, cousins, and his second family in Florida. Tributes may be posted at www.sharpfuneralhomes.com. To send flowers or a remembrance gift to the family of Christopher Allan Lambert, please visit our Tribute Store. "Email Address" would like to share the life celebration of Christopher Allan Lambert. Click on the "link" to go to share a favorite memory or leave a condolence message for the family.